GIS contributes significantly to water board operations. It is especially valuable for internal and intra-agency communications. ArcGIS is the standard GIS platform for all water boards in the Netherlands. According to Ignaas Bisdom, a GIS analyst for Scheldestromen Water Board, the board handles many business processes with ArcGIS apps, templates, and dashboards. By using what the ArcGIS Online platform provides and configuring apps, the board has eliminated the need for customization. 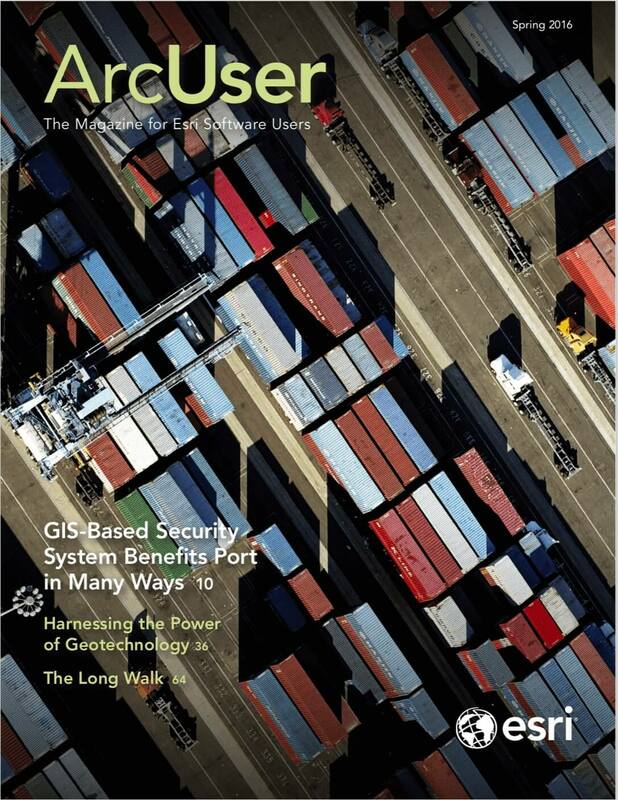 “The cost reduction realized by using standard tools is enormous, but in this way we will also be able to incorporate new features as they are added to the ArcGIS platform,” said Bisdom. 3D imagery, an aspect of the standard capabilities in ArcGIS, can provide further insight and allow decisions to be made more quickly. The Meermin III, a survey boat, regularly travels along the coast in Zeeland for the Scheldestromen Water Board. As part of the board’s annual monitoring of the flood defenses along the coast, this boat measures the location and height of the defenses from the foreshore. The foreshore, that portion of the seashore that is between the high-water and low-water marks, is often about 200 meters out from the edge of the coast. 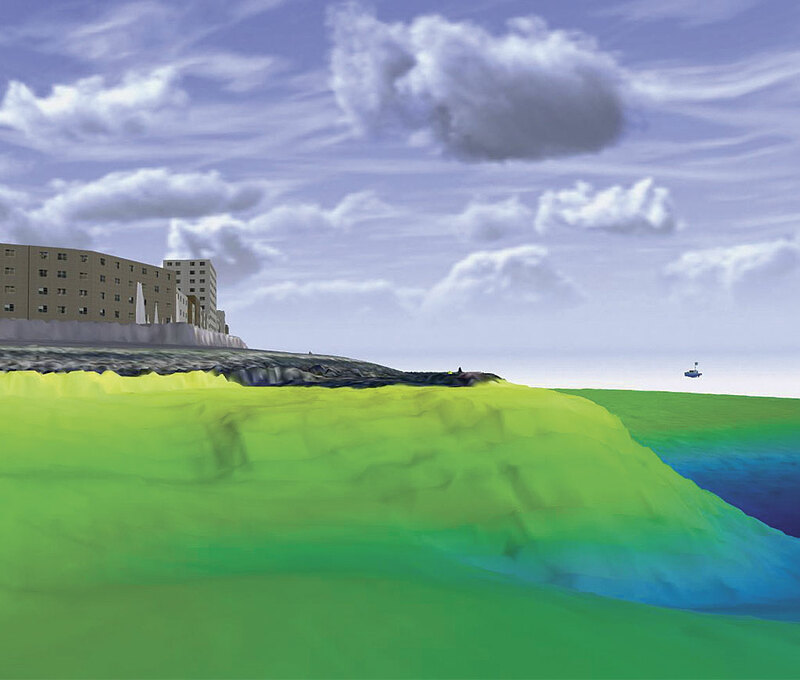 In the past, measurements of the foreshore were made using tangential measuring points, but now this area is measured by making a 3D scan of the entire surface of the seabed. Data on the condition of these defenses has been collected for decades so that historical visualizations and analyses can be made. Based on that data, it is possible to determine whether the section of the dyke under the water’s surface is holding strong, or whether it has been subject to erosion and should be strengthened. “Previously, it was difficult to get an overview of the situation. This wasn’t very surprising, because figures didn’t provide much information and 2D maps are not always suitable. 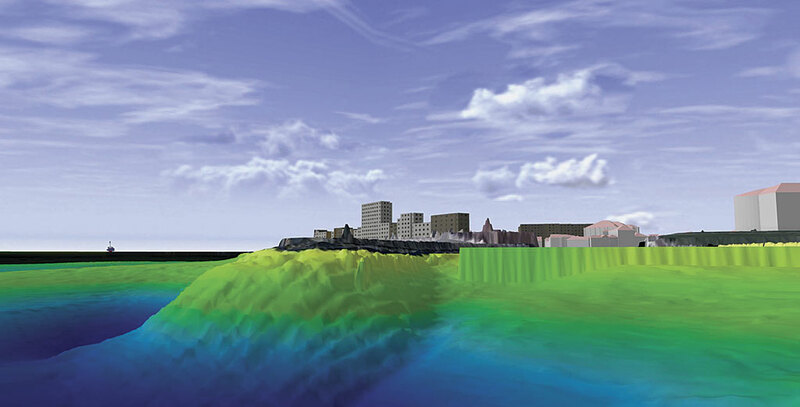 Visualization in 3D provides the viewpoint missing from 2D representations and are more easily understood by people who are not as familiar with maps,” explained Jelmer van der Veen, a GIS analyst and applications manager for the Scheldestromen Water Board. The water board initially worked with 3D analysis in mid-2014. Raster data was combined with digital elevation model data in Actueel Hoogtebestand Nederland (AHN) format and visualized using ArcScene and CityEngine. The seafront promenade at Vlissingen was the first visualization project. “This was interesting, because the foreshore already dipped very quickly at this point. There was a shear. In the viewer, you can see how the situation was and how it is now,” said Van der Veen.